Advocate staff photo by SHERRI MILLER — The old Godchaux Grammar school in Reserve on Monday, Oct. 20, 2014. 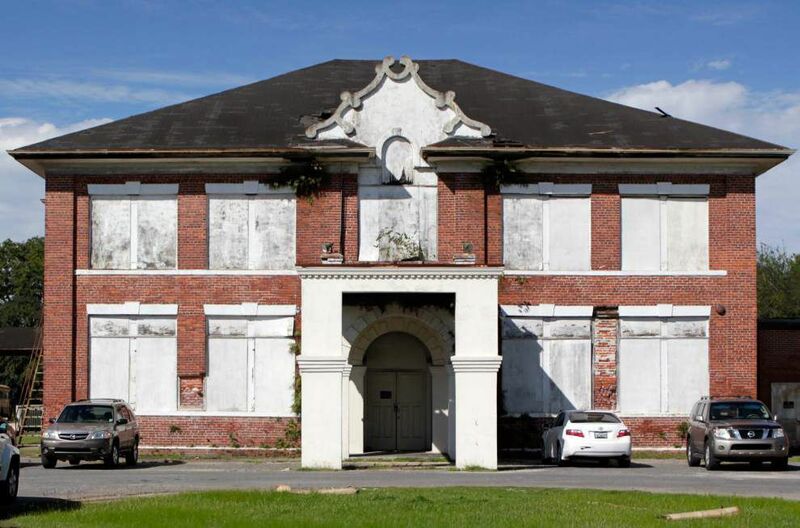 Efforts are underway to restore a nearly century-old high school building in St. John the Baptist Parish that has fallen into disrepair — a project that could cost close to $5 million. The two-story Leon Godchaux High School, near the intersection of West 10th Street and River Road in Reserve, has been sitting vacant since the late 1980s. Built early in the last century, the school was named after the local sugar magnate whose family donated the land for it. These days, the building is in such bad shape that an engineering firm recently recommended demolishing it. For years, the dilemma for school officials has been deciding whether to repair the building or tear it down, said Gerald Keller, a lifelong Reserve resident and a longtime School Board member. “The property, the building, is starting to fall apart,” he said of the historic structure, which sits near the School Board’s office. Keller wants to renovate the building and potentially convert it into a sugar museum in a nod to the industry that was long the area’s economic driver. It might also serve as a visitors’ welcome center, or both. To do that, Keller has helped revive a long-dormant local historical society, which is now exploring how to bring in the necessary cash, likely through some combination of fundraisers, grants and donations from local businesses. After they get a plan together, the group will present it to the School Board, which would have to declare the property unusable so the historical society could move to acquire it. The building, which comprises about 15,000 square feet of space, suffers from a litany of problems. Sections of its roof are missing, which has led to extensive water damage; metal doors are severely rusted; the electrical system and wiring need to be replaced; and the building’s entrance is in “deplorable condition and must be reconstructed,” according to a report by All South Consulting Engineers of Metairie. Overall, the cost of repairing the building is estimated at between $3.2 million for a partial historic restoration and $4.8 million for a full renovation. Keller pushed back against the idea of knocking it down, pointing out that the building was donated to the school district under the condition that it be used for educational or cultural purposes; otherwise, it would be returned to the family. The historical group is planning to gather feedback and ideas for preserving the building from local residents over several days in April. Stubbs said they’re also hopeful about restoring the nearby Godchaux-Reserve Plantation House, which is listed on the National Register of Historic Places but also has fallen into disrepair. Aside from immediate funding needs, he said, the group will be looking at ways to ensure the buildings will have a stable source of income in the future so they can be maintained.